A bad witch's blog: Witch Room Tales: What Occult Bums Sat Here? Witch Room Tales: What Occult Bums Sat Here? 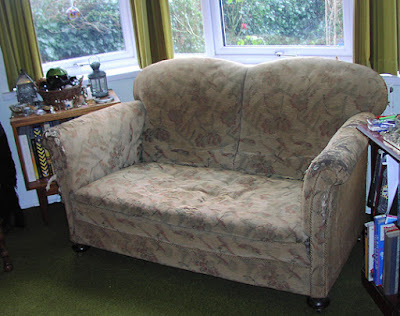 This ancient sofa is one of the things in my witch room. Yes, I know, I am pretty lucky having an entire room where I keep my witchy things and work magic. This sofa is certainly not one of the most attractive items in the room though. It isn't even a very comfortable sofa. It is quite literally about 100 years old. It is very hard to sit on, rather itchy because it is stuffed with horse hair, and has been well and truly scratched by cats over the decades. So, why do I keep it? Well, it belonged to my grandma, so partly I keep it just for that reason. But I also keep it because it has a bit of a magical past. As I've mentioned before, my grandma was an astrologer who worked for Alan Leo and moved in occult circles. She did Gerald Gardner's horoscope, for example. Imagine all the famous magical people from bygone times who might have rested their bottoms on that sofa. It might not be very comfortable, but it has history. One of my new year resolutions for 2018 was to blog about some of the items in my witchy room. I first did a post of that kind back in 2016, when I wrote a post called Tales from the Witch Room - about decorating the room. This year, each month I will focus on a different aspect of the room and the items in it.